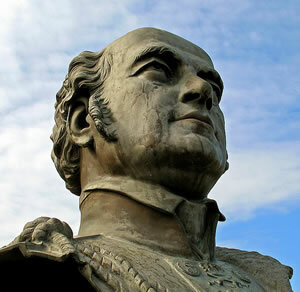 In the summer of 1845, British explorer Sir John Franklin led an expedition in search of the Northwest Passage in what is now the Canadian Arctic. The two wooden sailing ships "The Erebus" and "The Terror" had a total of 129 men on board when they were last seen entering the ice choked Davis Strait. They all perished and the ships have only recently been discovered. We know that they circled Cornwallis Island and spent the first winter on Beechey Island. In the spring of 1846, the ships broke free of the ice and sailed southwards towards King William Island where they got caught in an ice jam. This became their home for the next two years and when it became apparent that the ships would never break free, they abandoned them and headed to the nearest land. On April 25, 1848 thay landed at Victory Point on King William Island. They made a desperate attempt to head southwards to be rescued but it appears that they all perished during the next few weeks. The stories of the local Inuit people who witnessed their struggle and the discovery of a single note left by Franklin's men under a cairn are all that we have to go on. In 1992 Barry Ranford and Michael Yarascavitch went to King William Island and hired some local Inuit to take them out onto the land. Barry discovered what he thought was an old Franklin campsite and returned to share the story with his friend John Harrington. Between them they sought government approval and private sponsorship for a return trip in the summer of 1993. The government of The Northwest Territories provided approval and support and private corporations provided funding for what turned out to be a very historic trip. The expedition proved among other things that Franklin's men were forced into cannibalism in a last desperate attempt to survive. 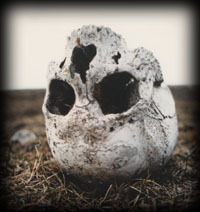 Of the 300 bones collected by the team and later analysed by Dr Anne Keenleyside at MacMaster University, more than 90 of them had knife marks consistant with cannibalism. 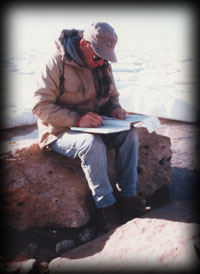 With the death of Barry Ranford in 1996 John assumed the role of team leader and has made a total of ten trips in search of evidence of the Franklin Expedition. John's team varies from year to year but the goal remains the same: find out as much as you can before the forces of nature destroy the evidence. Over the years John has likely walked more than a thousand miles and has travelled hundreds more on the Arctic Ocean in an 18 foot aluminum boat. John has helped gather and bury the remains of 14 of Franklin's men. His teams have made some amazing discoveries including 3 Franklin lifeboats, several encampments and countless artifacts. The rules of travelling in the area are very simple: don't touch anything and report all finds to the government authorities. Only with government permission were the human remains gathered and buried. John has kept meticulous notes of each trip in diary format. Each diary has numerous sketches done in exacting detail. John is making copies of these diaries available in very limited edition. 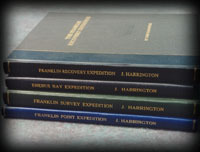 Only 129 beautifully bound copies of each diary will be done, each one in memory of one of Franklin's crew. Each one will have the sketches hand coloured by John - truly a collector's item. They will sell for $350 Canadian each and should be ordered directly from John (see "contact us"). Allow 6 weeks for delivery.